Edible flower arrangements make an attractive table centerpiece for a party, shower or special event. These arrangements are not challenging to make and reward you with an attractive and whimsical centerpiece as well as a healthy snack. One edible fruit bouquet should take 30 to 45 minutes to make, depending on your knife skills and comfort handing food. The arrangements don't last long (since fruit can spoil), so keep them cold until you need them or make them the day of your party. Place your fruit on a cutting board. 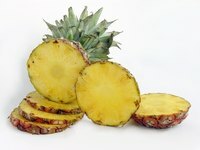 Cut a pineapple into 3/4 to one-inch-thick slices. Do not peel the fruit first. Place your flower cookie cutter in the center of the fruit. Push down to cut out a flower. Discard the scrap outside of the flower. Repeat this process with all the pineapple slices to create fruit flowers. Pick centers for your flowers, using contrasting colors. Berries or grapes make no-fuss centers or you can use small melon balls. Make as many centers as you have flowers. Place one gumdrop on a wooden skewer. It will help prop up your edible flower. Slide the fruit flower onto the skewer so it rests against the gumdrop. Then push the flower center (for example, a red grape) onto the skewer so that it camouflages the skewer end. Repeat this process for each flower to create a bouquet. Place your edible fruit flowers into a vase containing florist foam. Insert the skewers into the florist foam to prop them up. Use several cookie cutters to vary the size and shape of the flowers in your fruit bouquet.